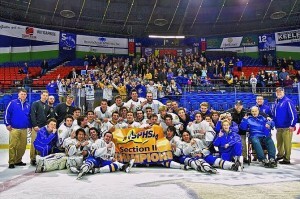 One year without a Section III Division I championship was, for the West Genesee ice hockey team, one too many. And it only figured that, in order to get to the title back, it had to do so against the Baldwinsville side that dethroned the Wildcats in the first place. In a close, fiercely-fought sectional final Sunday at Utica Memorial Auditorium, the Wildcats could not get on the board until the waning moments of the second period, but that goal, combined with a tremendous defensive effort, proved enough to earn a 1-0 victory over the Bees. That makes it eight sectional titles in the last nine years for the Wildcats, though everything about this particular run was inspired by the loss WG took to B’ville in last year’s sectional semifinals, and then seeing the Bees go all the way to the state title game. “It gave us even more motivation,” said senior defenseman Matt McDonald. WG did not taste defeat in either regular-season meeting with B’ville, winning 3-0 on Dec. 11 at Shove Park and forcing the Bees to make a third-period comeback to pull out a 2-2 tie at Lysander Arena on Feb. 2. Having breezed through two sectional playoff opponents (Rome Free Academy and Cicero-North Syracuse) by a combined 14-0 margin, WG knew B’ville would offer up far more resistance, physical and otherwise, and the early portion of the game was marked by hard hits and few great scoring chances on either side. Gradually, the Wildcats assumed control, but it didn’t show on the scoreboard. WG had 13 shots in the first period, all of them turned away by Matt Sabourin to keep it 0-0 despite the Bees only having four shots of its own. Winning this game would require patience and maturity on WG’s part. Sabourin made more big stops throughout the second period, working his total to 19 saves while seeing his B’ville teammates rarely get any good chances of its own. The breakthrough came 30.9 seconds before the second intermission. Again WG was circling the puck in the Bees’ end when Marshall Winn dug it out of the boards and passed to McDonald. From the point, McDonald launched a wrist shot that Jeff Kopek tipped past Sabourin before the Bees’ netminder could even react. Knowing it had squandered a lead twice as big at Lysander against this same B’ville team earlier in the month, the Wildcats kept on the attack. If nothing else, it would maintain the game’s pattern of the Bees rarely putting together any sort of sustained pressure against WG goalie Sammy Colabufo. Any time B’ville did get an odd-man rush, one Wildcat defender or another was able to get their bodies in front of the puck, limiting the damage. Even in the final minutes, when it needed to generate some opportunities, WG snuffed them out. B’ville couldn’t pull Sabourin for an extra attacker until the final 30 seconds, still enough time to do something – but one more time, WG turned the Bees away with a series of blocked shots as the clock ran out on the Wildcats’ third straight post-season shutout. WG made its way back to the title game through one more strong home effort in last Wednesday night’s sectional Division I semifinal, where Cicero-North Syracuse hung close for a time, but got overwhelmed in the third period as the Wildcats shut out the Northstars 6-0. C-NS had visited Shove Park before this season, on Jan. 12, and left Camillus on the wrong end of a 5-0 shutout. Though it had improved plenty since and ripped Fulton 6-2 in the opening round of the sectional tournament, the Northstars found that time hadn’t closed its gap with the Wildcats. Winn got it started, netting WG’s first goal 3:13 into the game. For the rest of the first period, C-NS did its best to stay within sight, getting lots of stops from its goaltender, Jack Doren, who would finish the night with 40 saves. Deep into the second period, it remained 1-0, but the Wildcats were patient, and that was rewarded when Kopek converted midway through that frame, doubling the margin, where it stood with one period left. WG began the getaway when Jay Considine converted his second goal 25 seconds into the third period. Not long after, Daniel Colabufo scored, and Ryan McDonald joined in with a power-play, all within the first 4:05 of the period. Considine tacked on a second goal late in the game, to go with his pair of assists. Kopek and Pat McDonald were even more generous, earning three assists apiece, while Ryan McDonald had two assists. Winn and Colabufo contributed single assists. Four days later, the sectional title was heading back to Camillus. Now with a chance to go after the program’s fourth state championship, and first since 2010, the Wildcats will host Ithaca (Section IV) in the Division I regional final Saturday night at 7 p.m. at Shove Park, needing just one more victory to get to the March 12-13 state “Frozen Four” at Buffalo’s HarborCenter. Though WG beat Ithaca 6-0 nearly three months ago, on Dec. 4, Colabufo said he and his players aren’t taking the Little Red lightly because, as the lone Section IV representative, Ithaca has spent the entire season preparing for this single game.